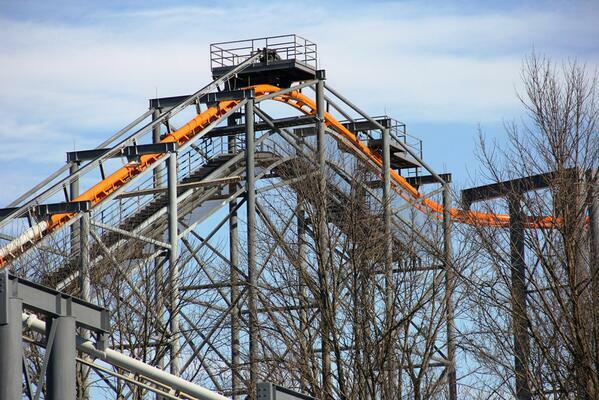 Despite Winter Weather, Kings Island Keeps Moving! The Overhaul of Flight Deck and it's complete change over to "The Bat" is making good progress. Kings Island has posted up this image to their Twitter Account. Showing that the paint is going down for the big conversion. The new Orange and Black theme is a great improvement over the previous "Steel Gray" incarnation of the previous "Top Gun" coaster which was renamed "Flight Deck" after Cedar Fair bought the park from Paramount. It's still unknown if the ride cars will receive a full new theme to go along with this change over. Either way, It's AWESOME to see The Bat Return in some shape!